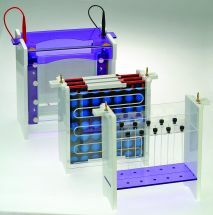 The omniPAGE range of Modular Vertical Gel Systems allow multiple electrophoresis techniques to be performed in the same unit. 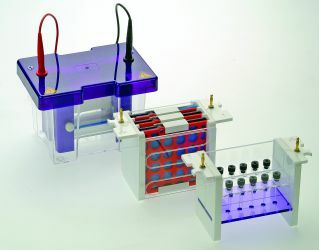 Using the same main tank and lid, three different inserts are interchangeable for slab gel, tube gel and electroblotting techniques. These systems are available in three size options, Mini 10 x 10cm, Mini Wide 20 x 10cm and Maxi 20 x 20cm and are available as individual, combination or complete modular systems. Combination and modular systems offer maximum value and space and have the added benefit of increased consistency which results from using the same universal base and lid. These systems include all modules and accessories required for Slab Gel Electrophoresis, 2-D Electrophoresis and Electroblotting. The central component is the omniPAGE Mini Vertical unit, Mini Wide Vertical Unit or omniPAGE Maxi Vertical unit. These include a rapid and intuitive casting system, enhanced and easy to set up cooling system and have increased capacity - can run up to four gels per run. In addition, the omniPAGE Tube gel module is capable of resolving up to 10 first dimension gels and the Electroblotting module has a three blot capacity. The package includes all the necessary accessories for Slab Gel, First Dimension and Electroblotting. Each of these techniques benefits from rapid set up cooling packs which provide enhanced resolution even during high intensity 2-D electrophoresis and Electroblotting.